Beats By Dre advertises its Powerbeats3 Wireless in a new ad campaign, titled “Made To Push Limits,” that features several football teams. 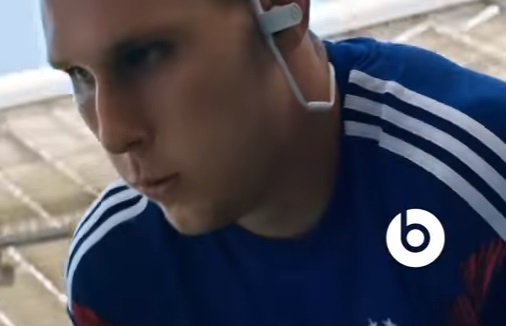 One of them is dedicated to FC Bayern and shows some of its players training on the field, before a game, while listening to music through Beats Powerbeats3 Wireless, which are “made to push limits”. The soundtrack is a snippet of Anderson Paak’s newest single, titled “Left to Right”. Other teams featuring in the campaign are the French professional football club Paris Saint-Germain and the professional football club in London Chelsea F.C. The Powerbeats3 Wireless earphones, featuring flexible, secure-fit earhooks to maximize comfort and stability and sweat and water resistance to handle tough training, allow users to connect via Class 1 Bluetooth with their device for wireless workout freedom, take calls, control their music and activate Siri with RemoteTalk. They boast up to 12 hours of battery life to power through multiple workouts and, with Fast Fuel, a 5-minute charge gives one hour of playback when the battery is low. The retailing price is $199.95 on the brand’s website. A month ago, Beats By Dre featured in one of its spots Serena Williams as the “Queen of Queens” while the 2018 single “Majesty” by Nicky Minaj, who also starred, was playing in the background. In addition, the leading audio brand celebrated its status of headphone, home speaker and audio partner of the NBA, WNBA, NBA G League and USA Basketball in a commercial featuring a host of NBA stars, from LeBron James, Draymond Green, James Harden, Ben Simmons, Karl Anthony-Towns, and more. The partnership is not the first that Beats has entered a with a major sports league. In 2015, Major League Baseball sold team-specific Beats headphones for a limited period, but a long-term relationship has yet to be established.